Director – Ron Howard, Screenplay – Jeffrey Price & Peter S. Seaman, Based on the Book by Dr Seuss, Producers – Ron Howard & Brian Grazer, Photography – Donald Peterman, Music – James Horner, Music Supervisor – Bonnie Greenberg, Visual Effects Supervisor – Kevin Mack, Visual Effects – Digital Domain, Additional Visual Effects Supervisor – Kurt Williams, Additional Visual Effects – Centropolis (Supervisor – Conny Fauser), Rhythm and Hues (Supervisor – Edwin Rivera) & Spratt Animation and Virtual Magic, Special Effects Supervisor – Allen Hall, Makeup Effects – Rick Baker, Production Design – Michael Corenblith. Production Company – Imagine Entertainment/Universal. 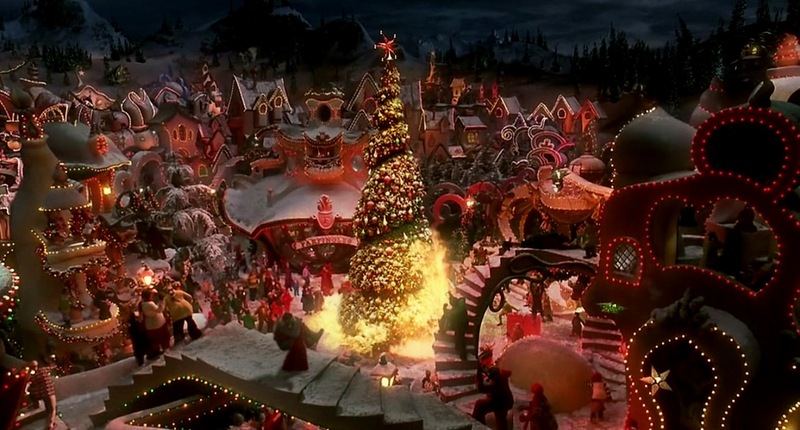 The inhabitants of the peaceful town of Whoville like nothing more in life than Christmas. 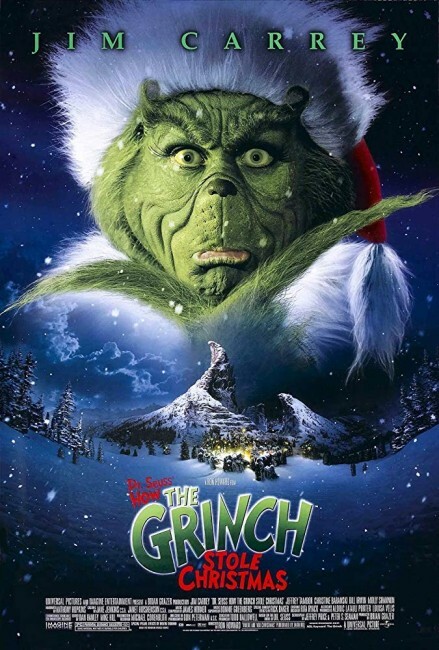 As Christmas nears, young Cindy Lou Who becomes curious about The Grinch, a former resident of the town who was shunned because of his hairy, green-skinned appearance, and now lives in misanthropic seclusion on Mount Crumpit hating everything that is Christmas. Cindy nominates The Grinch for the town’s Whobilation prize and persuades him to come and accept it. However, when The Grinch feels humiliated by the townsfolk, he plots a horrible revenge – that of stealing Christmas away from the Whovians. Theodor Seuss Geisel (1904-1991), better known as Dr Seuss, has become one of the pre-eminent names in children’s writing. Seuss was originally a cartoonist and broke into children’s writing in the 1930s after being inspired by an article in Life magazine that spoke of the illiteracy rate in American children. Dr Seuss was a popular writer throughout the 1930s and 40s with some of his stories being adapted as short animated films. A publisher issued Seuss a challenge to write a book using only 250 of the words that would most easily be absorbed by a first-grader. The result was The Cat in the Hat (1955) in which Seuss patented his famous nonsense rhymes and absurdist stories. Seuss would go onto to write such classic works as Green Eggs and Ham (1960) and How the Grinch Stole Christmas (1957) among a great many others. How the Grinch Stole Christmas had previously been adapted as a well remembered, perennially revived 26-minute cartoon How the Grinch Stole Christmas (1966) by animator Chuck Jones with Boris Karloff as the voice of the Grinch, with a script written by Seuss. This live-action adaptation of the story comes from Ron Howard. Ron Howard is a popular director whose Imagine Entertainment is one of the top production companies in Hollywood, having produced everything from the Eddie Murphy Nutty Professor films to John Waters’ Cry-Baby (1990), Oliver Stone’s The Doors (1991) and the remake of Psycho (1998). On the other hand, Ron Howard’s films as director always seem to lack a critical strength at heart. Howard seems to want to be another Spielberg or a Lucas but seems to lack what it takes. His attempt to make another E.T.– The Extra-Terrestrial (1982) only produced the soft-headed Cocoon (1985); his attempt to produce another Star Wars (1977) ended up with Willow (1988), which was a shallow handful of sword and sorcery cliches. His attempts at serious dramatic films end up with the likes of Far and Away (1992), The Paper (1994), Apollo 13 (1995) (probably his best film), Ransom (1996) and A Beautiful Mind (2001), which usually substitute simplistic emotional cues and a sense of decency for serious drama. Howard seems most at home directing light comedy – in particular Splash! (1984). Based on Ron Howard’s banal track record, one did not have much in the way of hope for How the Grinch Stole Christmas. A sizeable $120 million budget was lavished to bring Dr Seuss’s surreal world to life. Directorially Ron Howard has aimed to create a wilfully unreal absurdism – images of babies being delivered in baskets by parachute, tuba players that reveal miniature tuba players hidden inside the cone of the instrument, the akilter Christmas card sets, literal depictions of nonsense cartoon physics. At the same time, the film feels in danger of being quashed by all the A-budget lustre – the sets do not strike you so much with their zaniness as they do with so much having been packed in it is impossible to watch everything. How the Grinch Stole Christmas‘s ace in the hole is surprisingly Jim Carrey. Carrey’s OTT performances in the likes of Ace Ventura, Pet Detective (1994), The Mask (1994), The Cable Guy (1996) and Liar Liar (1997) have the habit of being so loud they drown out everything else in the film. At the point that he made How the Grinch Stole Christmas, Carrey has concertedly been trying to break through as a serious actor in the likes of The Truman Show (1998), Man in the Moon (1999) and The Majestic (2001). Although unrecognisably buried beneath a Rick Baker makeup job, Carrey gives a performance where he puts the cap on rafter-rattling excess and evinces there is a lovable curmudgeon inside the makeup. 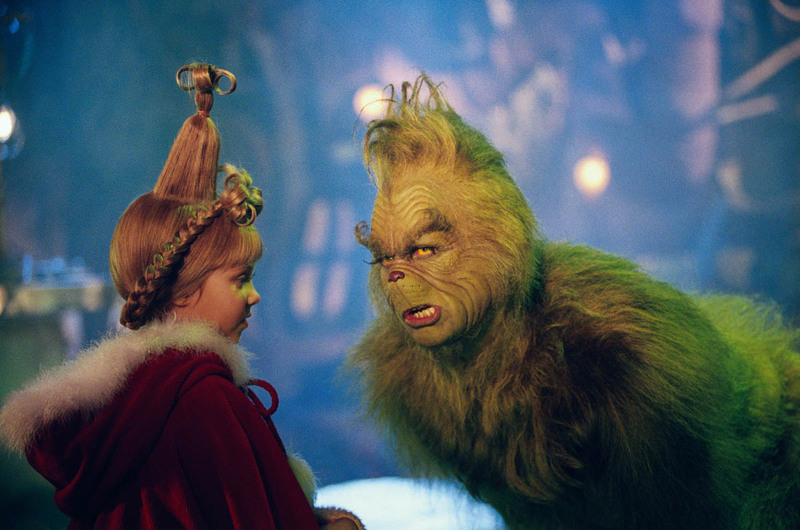 One never thought they would say it about Jim Carrey but he gives How the Grinch Stole Christmas its life. Without him, the film would be a leaden over-produced confection. How the Grinch Stole Christmas (2018) was later remade as the animated The Grinch (2018). Ron Howard’s producer Brian Grazer next went onto make another live-action Dr Seuss production The Cat in the Hat (2003). Other feature-length films adapted from Dr Seuss works are The 5000 Fingers of Dr T (1953), based on Seuss’s original screenplay, the animated adaptations of Horton Hears a Who! (2008) and The Lorax (2012). Ron Howard’s other genre films are:– the mermaid comedy Splash! (1984); Cocoon (1985) about a meeting between geriatrics and extra-terrestrials; the George Lucas sword-and-sorcery collaboration Willow (1988); Apollo 13 (1995) based on the true life 1970 space mission disaster; the supernatural Western The Missing (2003); The Da Vinci Code (2006) based on the historical/religious conspiracy bestseller and its sequels Angels & Demons (2009) and Inferno (2016); and Solo: A Star Wars Story (2018). (Nominee Best Makeup Effects and Best Production Design at this site’s Best of 2000 Awards. No. 1 on the SF, Horror & Fantasy Box-Office Top 10 of 2000 list).